ABS1 was only used on K75, K100, and 1993 K1100LT. It's recognizable by the modulator units mounted to the footpeg plates. A fault is indicated by the ABS light and the bulb monitor flashing in unison. The bulb monitor will be on continuously until the system has verified operation of both brake switches and both bulb filaments (taillight and brake light) and then it extinguishes and becomes the second ABS light. The primary ABS light (and the monitor light, once its test is complete) will flash in unison until the bike moves off. If they continue to flash in unison after that, there is a fault. You will probably get a fault #7 upon startup after you have left the battery disconnected for a period of time. ABS2 was used on K1100 from 1994 onwards, R1100RS/RT/GS/R, R1200C, and to 2000~2002 on the R1100S, R1150GS, and K12 models. * The K11 ABS2 uses the same two warning lights as ABS1: the ABS light and the bulb monitor light. On Oilheads and K12s, it has two distinct lights of its own. At key-on, the two lights will flash together and continue to do so until the self-test is complete (which doesn't happen until you start to ride away), at which time they extinguish. If the self-test fails, they will begin to flash alternately. The exact moment when the fault happens will help you know what caused it: if it happens before you start the engine it is an item that is tested at power-up. If it fails when you start the engine, it is almost certainly low battery voltage. And if it fails when you ride away, it's probably a modulator or a wheel speed sensor. Sometimes ABS2 will fault without showing a fault code that you can read without the diagnostic computer. If you normally get a whining noise when you apply the brakes, and notice that they are power-assisted, you have iABS. This was used on all R1150RS/RT/R, and starting 2001~2003 with the R1150GS, K1200RS/LT, R1100S and later R1200C versions. * Faults are displayed by use of the GEN and ABS lights. Faults remain in memory but the warning lights will extinguish and ABS opration will return once the cause of the fault is fixed. * ABS2 was used until: Feb '01 on R1100S, MY01 on K1200RS, Sept '02 on 1150GS. Later bikes have iABS, including all K12GT and R1200CL/Montauk. With a wire, ground the brown/blue stripe wire (pin #2) and keep it grounded. Hold the ABS button down for about 8 seconds. Turn off the ignition, remove wire. "On my 2000 K1200LT the brown/blue wire was the correct wire to use on the diagnostic plug. You have to remove the large 25 pin connector from the ABS unit, remove one tie wrap and three phillips head screws on the connector (two are under the rubber that was held on by the tie wrap). After you have done this and exposed the wires and female connector plug you can see where pin 21 is numbered on the connector. I used a 14 gage wire with an aligator clip on one end with about 1/16" of copper exposed and plugged it in the pin 21 slot and reinstalled the connector without the connector housing. I then made sure it felt like I had good contact on pin 21. I then used a straight pin and another 14 gage piece of wire with an aligator clip to pin into the brown and blue wire on the maintenance connector and then aligator clipped this to the negative terminal on the battery. I then turned the key to on and then touched the aligator clip from pin 21 to the negative terminal on the battery (8 seconds is fine but mine immediately reset). The ABS lights went from alternate flashing to normal flashing simultaneously. I am adding a reset button before I reassemble the connector housing. Just have to find the right insert for that connector." Info on diagnosing ABS1 and ABS2 faults is described by Brian Curry in great detail on the IBMWR K-tech pages. In a nutshell, by putting a readout light between the ABS pin and ground you can get a blink code when the bike is on. All codes except 5 seem to be persistent (needing reset by this procedure). There is also a BMW document, part 01 71 9 798 811 (5/90), that you may be able to locate which is for troubleshooting ABS. These should be listed on a sticker supplied with the bike or a table in the Rider's Manual. Gen OFF, ABS ON = Only residual braking in both circuits. Gen OFF, ABS flashes at 1Hz = ABS not available. Pull-away test not completed. Gen OFF, ABS flashes at 4Hz = Only residual braking function available in both circuits. Self-diagnosis not completed. Gen ON, ABS off = Tail light/brake light defective. Gen ON, ABS flashes at 1 Hz = At least one brake circuit without ABS. 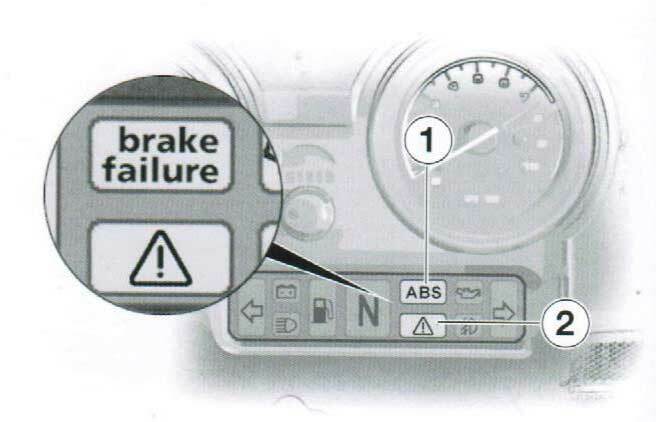 Gen ON, ABS flashes at 4Hz =At least one brake circuit in residual braking function mode. Gen AND ABS flashing alternately at 1Hz = Fluid level in Integral ABS too low. For the US market the upper light says brake failure. The lower light is the General Warning Light. This coding might only apply to the 34 51 2 331 935 ABS unit. Other units can be damaged or will not respond to the recoding. Go to Guided Diagnostics, ABS2, you will get a fault code for incorrect coding. Go to ABS unit, wrong coding. When you accept that, the very next screen asks if you want to recode it. Of course you do. Proceed with the usual turning the key on and off as prompted, and all is done. To disable ABS on the R1100GS, you hold the ABS button down whilst turning the ignition on. This should leave one ABS light lit, which will flash as you ride. Low voltage has been blamed for ABS faults on a number of bikes, and those bikes have been fixed by going to a different battery, usually a sealed one. Sealed batteries have significantly higher voltage due to the chemical differences, usually about 12.85 to 12.95, instead of the 12.60 to 12.80 typical of flooded designs. For a bit more insight into this you might want to check out my article explaining a bit about the chemistry. If the lights initially flash together but alternate after you start the bike, you can try the "rolling restart." Ride away with lights flashing and on a straight section of road, in third gear or higher and maybe 2500 RPM, pull the clutch in and turn the key off with your right hand. Coast for one or two seconds, then turn the key back on and release the clutch to "bump-start" the motor. If the lights are flashing together, you're in luck, and next time you come to a stop and pull away you should get a successful ABS self-test. If so, you need a new battery or you have some other charging system problem. If not, you have some other fault. There is also a modification you can make so that the ABS unit is not powered up until after the motor is running; this will also cure low-battery problems. BMW batteries often (in my experience) have quite low voltage. This might be a carry-over from the days of the airheads, where cranking current was vital, but voltage wasn't. As you go to higher voltages, the cranking performance can suffer a bit, especially at low temperatures. More importantly, they are harder to recharge - an important point for most airheads. I have seen Mareg (BMW) batteries on properly functioning bikes at 12.40 volts and lower, fully charged, engine off - well below what is considered (I think by BMW) to be the minimum for good ABS operation. Dealers get the electrolyte for the batteries locally - not from BMW - so this aspect of the battery is not really BMW-controlled. Different dealers could be using different strengths of electrolyte. The article explains how this affects voltage. If your fully charged battery is at too low a voltage due to weak acid being used to fill it, you MAY be able to successfully raise the voltage by use of fresh electrolyte. Theory only! A way to do this would be to fully charge the battery, discharge it to a point where the electrolyte specific gravity is about .030 below the new electrolyte you have, then empty it and quickly refill with the new stuff. This will give you maybe a .020 increase in gravity and a 0.2 volt improvement. Don't shoot for anything higher than 1.285 or so. Remember, for a 12V battery the voltage is roughly ten times the acid gravity. 1.260 S.G. gives you around 12.60V. And don't let the battery stand without acid in it. If your problem is that the voltage drops too much when the key goes on, then the above IS NOT your problem. You probably want a stronger, or newer, battery. The success of the new sealed batteries in this area is largely due to the fact that the voltage doesn't drop as much while cranking, rather than simply higher overall voltage. This is a function of plate area, etc... read the article. You can make a simple readout light with a 2mA LED and a 1200-Ohm resistor in seies. Radio Shack also sells 12V LEDs such as 276-011B which work well all by themselves. Don't try to use an incandescent light bulb (a common test lamp) because it will draw too much current.